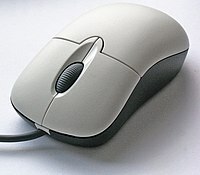 A computer mouse is a pointing device (hand control) that detects two-dimensional motion relative to a surface. This motion is typically translated into the motion of a pointer on a display, which allows a smooth control of the graphical user interface. Physically, a mouse consists of an object held in one's hand, with one or more buttons. Mice often also feature other elements, such as touch surfaces and "wheels", which enable additional control and dimensional input. Licensed under Creative Commons Attribution-Share Alike 2.5 (Darkone). This article is about the item of computer hardware. For the pointer it controls, see Pointer (user interface). The earliest known publication of the term mouse as referring to a computer pointing device is in Bill English's July 1965 publication, "Computer-Aided Display Control". The plural for the small rodent is always "mice" in modern usage. The plural of a computer mouse is "mouses" and "mice" according to most dictionaries, but "mice" being more common. The first recorded plural usage is "mice"; the online Oxford Dictionaries cites a 1984 use, and earlier uses include J. C. R. Licklider's "The Computer as a Communication Device" of 1968. The trackball, a related pointing device, was invented in 1946 by Ralph Benjamin as part of a World War I-era fire-control radar plotting system called Comprehensive Display System (CDS). Benjamin was then working for the British Royal Navy Scientific Service. Benjamin's project used analog computers to calculate the future position of target aircraft based on several initial input points provided by a user with a joystick. Benjamin felt that a more elegant input device was needed and invented what they called a "roller ball" for this purpose. Douglas Engelbart of the Stanford Research Institute (now SRI International) has been credited in published books by Thierry Bardini, Paul Ceruzzi, Howard Rheingold, and several others as the inventor of the mouse. Engelbart was also recognized as such in various obituary titles after his death in July 2013. In 1964, Bill English joined ARC, where he helped Engelbart build the first mouse prototype. They christened the device the mouse as early models had a cord attached to the rear part of the device which looked like a tail, and in turn resembled the common mouse. As noted above, this "mouse" was first mentioned in print in a July 1965 report, on which English was the lead author. On December 9, 1968, Engelbart publicly demonstrated the mouse at what would come to be known as The Mother of All Demos. Engelbart never received any royalties for it, as his employer SRI held the patent, which expired before the mouse became widely used in personal computers. In any event, the invention of the mouse was just a small part of Engelbart's much larger project of augmenting human intellect. On October 2, 1968, a mouse device named Rollkugel (German for "rolling ball") was described as an optional device for its SIG-100 terminal was developed by the German company Telefunken. As the name suggests and unlike Engelbart's mouse, the Telefunken model already had a ball. It was based on an earlier trackball-like device (also named Rollkugel) that was embedded into radar flight control desks. This trackball had been developed by a team led by Rainer Mallebrein at Telefunken Konstanz for the German Bundesanstalt für Flugsicherung as part of their TR 86 process computer system with its SIG 100-86 vector graphics terminal. The ball-based computer mouse with a Telefunken Rollkugel RKS 100-86 for their TR 86 computer system. When the development for the Telefunken main frame TR 440 (de) began in 1965, Mallebrein and his team came up with the idea of "reversing" the existing Rollkugel into a moveable mouse-like device, so that customers did not have to be bothered with mounting holes for the earlier trackball device. Together with light pens and trackballs, it was offered as an optional input device for their system since 1968. Some Rollkugel mouses installed at the Leibniz-Rechenzentrum in Munich in 1972 are well preserved in a museum. Telefunken considered the invention too unimportant to apply for a patent on it. By 1982 the Xerox 8010 was probably the best-known computer with a mouse. The Sun-1 also came with a mouse, and the forthcoming Apple Lisa was rumored to use one, but the peripheral remained obscure; Jack Hawley of The Mouse House reported that one buyer for a large organization believed at first that his company sold lab mice. Hawley, who manufactured mice for Xerox, stated that "Practically, I have the market all to myself right now"; a Hawley mouse cost $415. That year Microsoft made the decision to make the MS-DOS program Microsoft Word mouse-compatible, and developed the first PC-compatible mouse. Microsoft's mouse shipped in 1983, thus beginning the Microsoft Hardware division of the company. However, the mouse remained relatively obscure until the appearance of the Macintosh 128K (which included an updated version of the Lisa Mouse) in 1984, and of the Amiga 1000 and the Atari ST in 1985. The German company Telefunken published on their early ball mouse on October 2, 1968. Telefunken's mouse was sold as optional equipment for their computer systems. Bill English, builder of Engelbart's original mouse, created a ball mouse in 1972 while working for Xerox PARC. A recent consumer 3D pointing device is the Wii Remote. While primarily a motion-sensing device (that is, it can determine its orientation and direction of movement), Wii Remote can also detect its spatial position by comparing the distance and position of the lights from the IR emitter using its integrated IR camera (since the nunchuk accessory lacks a camera, it can only tell its current heading and orientation). The obvious drawback to this approach is that it can only produce spatial coordinates while its camera can see the sensor bar. More accurate consumer devices have since been released, including the PlayStation Move, the Razer Hydra and the controllers part of the HTC Vive virtual reality system. All of these devices can accurately detect position and orientation in 3D space regardless of angle relative to the sensor station. Logitech spacemouse 3D. On display at the Bolo Computer Museum, EPFL, Lausanne. Silicon Graphics SpaceBall model 1003 (1988), allowing manipulation of objects with 6 degrees of freedom. When holding a typical mouse, ulna and radius bones on the arm are crossed. Some designs attempt to place the palm more vertically, so the bones take more natural parallel position. Some limit wrist movement, encouraging to use arm instead that may be less precise but more optimal from the health point of view. A mouse may be angled from the thumb downward to the opposite side – this is known to reduce wrist pronation. However such optimizations make the mouse right or left hand specific, making more problematic to change the tired hand. Time magazine has criticized manufacturers for offering few or no left-handed ergonomic mice: "Oftentimes I felt like I was dealing with someone who’d never actually met a left-handed person before." The earliest mass-market mice, such as on the original Macintosh, Amiga, and Atari ST used a D-subminiature 9-pin connector to send the quadrature encoded X and Y axis signals directly, plus one pin per mouse button. The mouse was a simple optomechanical device, and the deciding circuitry was all in the main computer. In 1986 Apple first implemented the Apple Desktop Bus allowing the daisy-chaining together of up to 16 devices, including arbitrarily many mice and other devices on the same bus with no configuration whatsoever. Featuring only a single data pin, the bus used a purely polled approach to computer/mouse communications and survived as the standard on mainstream models (including a number of non-Apple workstations) until 1998 when iMac joined the industry-wide switch to using USB. Beginning with the Bronze Keyboard PowerBook G3 in May 1999, Apple dropped the external ADB port in favor of USB, but retained an internal ADB connection in the PowerBook G4 for communication with its built-in keyboard and trackpad until early 2005. Some systems allow two or more mice to be used at once as input devices. 16-bit era home computers such as the Amiga used this to allow computer games with two players interacting on the same computer (Lemmings and The Settlers for example). The same idea is sometimes used in collaborative software, e.g. to simulate a whiteboard that multiple users can draw on without passing a single mouse around.